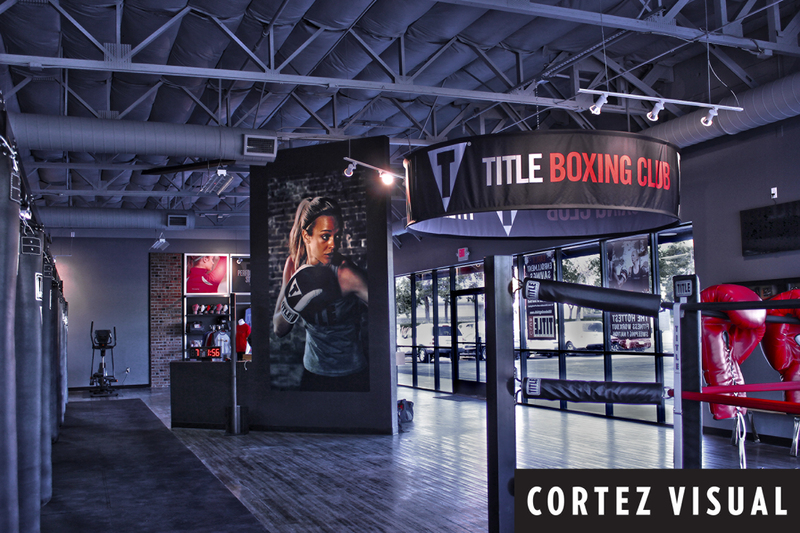 Check out this project we did for Title Boxing Club! We can design, print and install everything that you see here! Transform the interior of your business and enhance your branding with eye catching wall murals, banners, floor graphics or window graphics. Have something in mind? Learn more about large format printing or contact us today! Whether you are looking for commercial graphics for your business store front or something unique for your home, when it comes to large format printing, we can do it all! Window graphics, especially of large scale, is one of the first things a customer sees when they approach a business, so they are a great way to attract attention, advertise promotions, special events and other useful information. 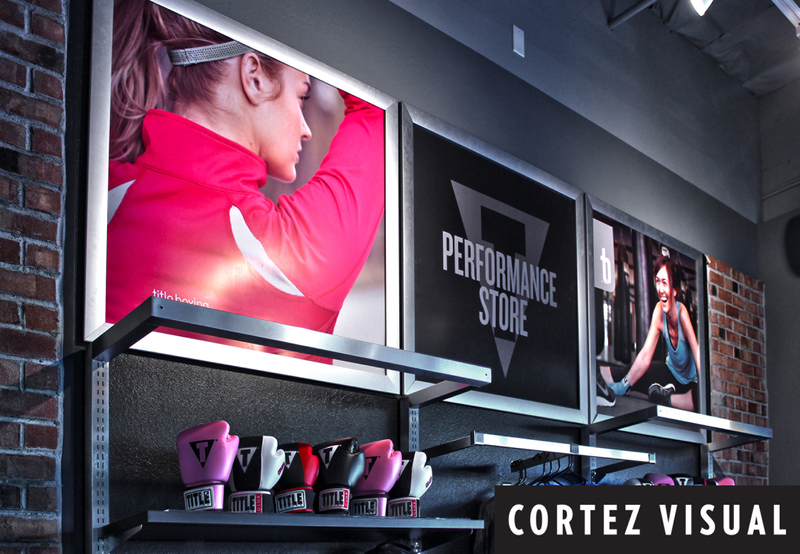 You can completely change the look of a store front with some eye-catching visuals! Window graphics, window clings and window signs are unique ways to turn unused window space into effective forms of advertising. Enhance your businesses windows, vehicle or even your home windows, and help reduce energy usage and cost at the same time. The windows in this example pictured above are from a project we did for Dave & Busters Restaurant. They are covered with our View Through Adhesive Vinyl, which looks solid from the outside, but can be seen through from the inside. This material blocks 50-60% of the sun hitting these windows, reducing the amount of air conditioning necessary to keep the interior comfortable, all while without blocking the view from the inside! 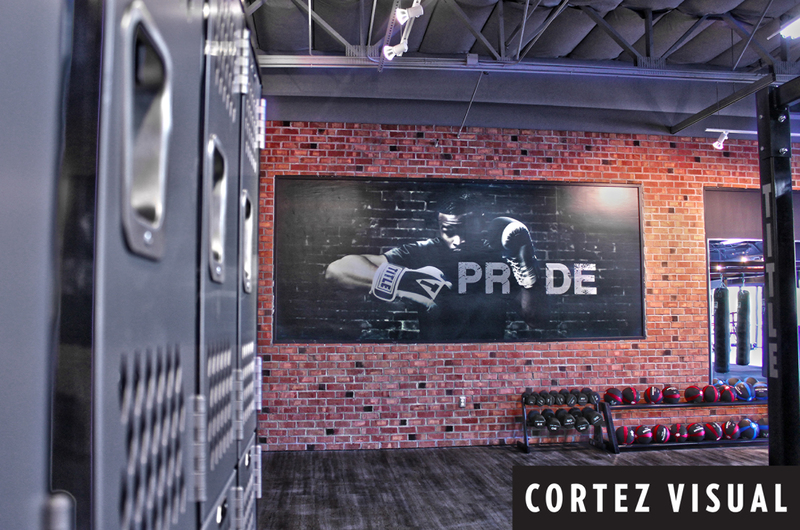 Custom wall graphics can be used in many different environments, they are great for commercial use as well as enhancing personal spaces. 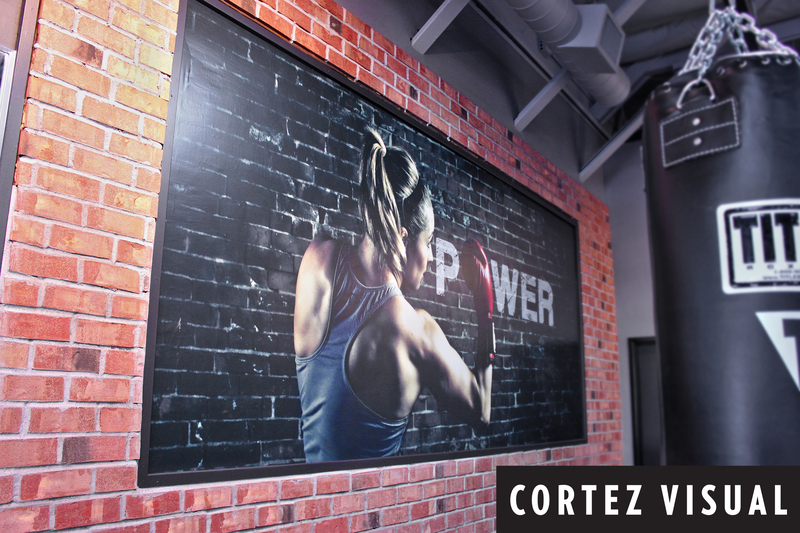 Wall graphics can make a dramatic presentation in commercial/retail environments, and the can be an interesting way to enhance and consistently brand the interior or window displays of businesses, medical facilities, schools, restaurants, night clubs, etc. Life-size images can help create an instant report with customers, and since we use materials that are inexpensive, removable, and reusable, it’s affordable and easy to change graphics to keep the images current to reflect any changes in your organization. Wall graphics can be unique works of art used to decorate at home as well; things such as large murals to transform your space, decorate a children’s room, wallpaper borders, and changeable wall accents are all becoming increasingly more popular! 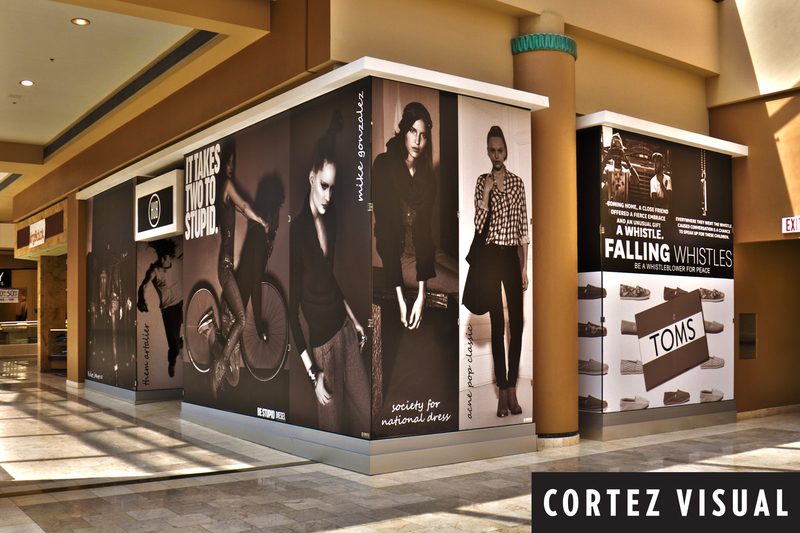 The wall graphics in the photo above are from a store front barricade for Hub Clothing, in Fashion Square Mall, while they were doing some remodeling. We make custom banner signs for both indoor and outdoor use. Banners are used for a variety of promotional purposes including sales and special events, product identification, school banners, church banners, sporting event banners, sponsor banners, trade show banners, and directional banners. Our high quality printing combined with our huge variety of banner materials means we can produce custom banners to suit just about any application. We offer a large selection of reinforced vinyl banner materials in various weights and finishes including some that can be printed on both sides that are popular for both indoor and outdoor use. We have synthetic banner materials that are great for indoor use, a wide range of fabric banner options as well as many options for mesh banners and a selection of specific environmentally friendly banner materials as well. 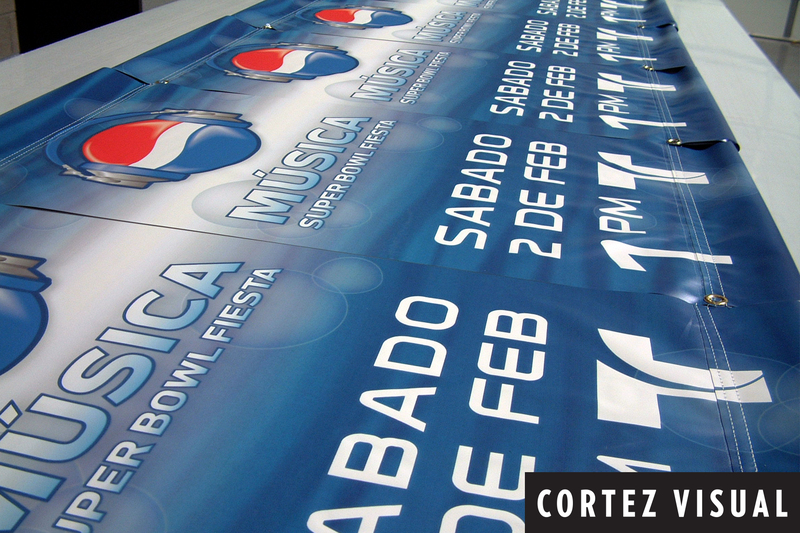 The banners in the photo above are from a project we did with the NFL and Pepsi for Superbowl XLII. Floor decals are a one-of-a-kind way to reach customers as they shop, promote an event, create or reinforce brand identity inside your business, direct traffic, and they can even be used to decorate for a special event. In a retail environment, floor graphics and floor ads can catch the attention of potential buyers before a shopping decision is made, giving you some input at a critical point in the buying process unlike any other form of advertising. Directional floor decals can help direct traffic for events or in large stores, busy offices or to help organize a warehouse. Floor decals can be used for special events, such as logos on a basketball court during a tournament, or special designs, photos or initials on a dance floor at a wedding or party. Since we have floor graphic materials for virtually any flooring surface, such as tile, carpet, or concrete, and even a floor decal material that can be repositioned and reused, there is no limit to how you can use this versatile form of advertising. Good floor decals and floor signs have laminates that are slip resistant, as well as scratch and scuff resistant so that heavy traffic doesn’t ruin them. Floor graphics should also hold up to common floor cleaning chemicals and methods. The floor decal adhesives should hold the floor graphics firmly in place, but come off without leaving adhesive residue or damaging the floor when removed. All our floor decal materials meet these requirements. 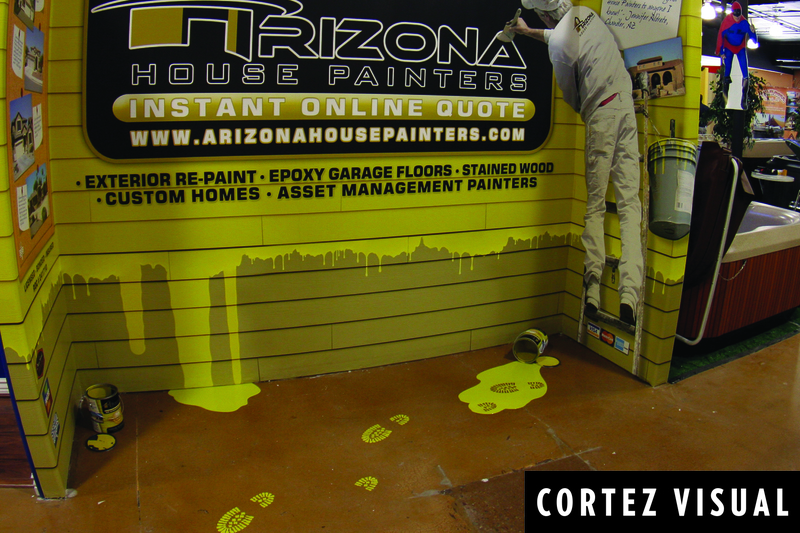 The floor graphics pictured above are from a unique project we did for Arizona House Painters booth at a trade show. Contact us today, we’ll help you figure out what type of large format printing would be best suited for your project and get you a price quote right away!